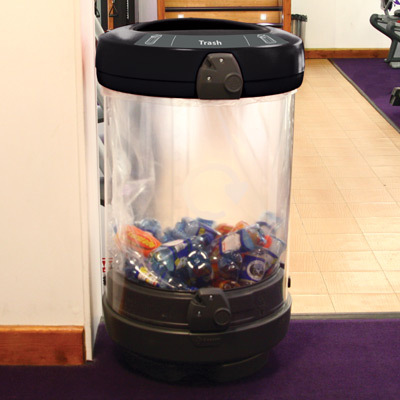 C-Thru 48 Gallon Trash Can - Glasdon, Inc. The C-Thru 48 Gallon Trash Can collects a substantial amount of waste and is highly suitable for playgrounds, theme parks, schools and colleges. A large 48 gallon capacity trash can with a clear body to enable viewing of contents to ensure that there is no contamination of waste. This large capacity C-Thru trash can is available with three different hood options all with a keyed locking mechanism, please contact us for further details.